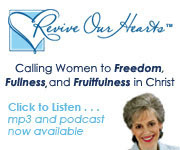 I've had the great privilege for 4 1/2 years now to help produce, record and edit Revive Our Hearts (ROH) - a woman's Bible teaching radio program whose aim is to call women to "freedom, fullness and fruitfulness in Christ." Nancy Leigh DeMoss is the teacher, and it's been an added privilege to get to know her personally over the years. I can honestly say that she is genuine, authentic and committed to our Lord. Her insight into the Scriptures has been extremely edifying to many women across the country. You can peruse her book writing ministry here, including her latest book, Choosing Forgiveness. I've never mentioned anything on this blog about ROH (other than the banner in the sidebar) - no particular reason - just never thought about it when I was in the blogging mood. Well, I'm in a blogging mood & I been thinking about a radio series beginning this Monday, February 12 that will run for over 5 weeks. The series is titled, The Counter-Cultural Woman: A Fresh Look at Proverbs 31. You can find out if/when ROH airs in your area here or just listen at your convenience online here. Also here, you can read the transcript and blog your own comments. The reason I wanted to link this here & now is because this is such a great series. This is the third time the series will have aired, but the first time it's aired in the new 25 minute format. There will also be new material added - testimonies, table talk, and more. Because of the comprehensive nature of Proverbs 31 and the insight Nancy has in applying these Truths to daily life, this series includes something about almost every area of womanhood. Consider just a few: time management, work ethics, money management, hospitality, giving, modesty, working at home (or outside the home? ), beauty, bargain shopping and much, much more! So, for you she-bloggers out there, I highly recommend this series. 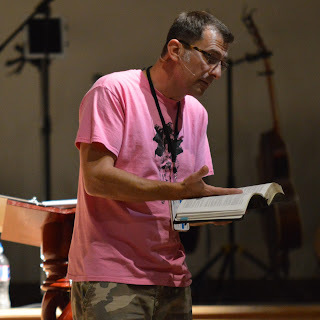 I trust you'll find it encouraging and edifying.